Weekend Dish is a place for me to get a little more personal! If you just come to Sunny Side Up for the food, feel free to skip this post but be sure to check back next week for new food photos and recipes! First, Happy Mother’s day! I wish I were in Ohio celebrating with my own mom, but I am so thankful for modern communication allowing us to to chat on the phone and text throughout the day. To the rest of the mom’s out there, hope you’ve had a great day so far. Thank you for all that you do as a mom! 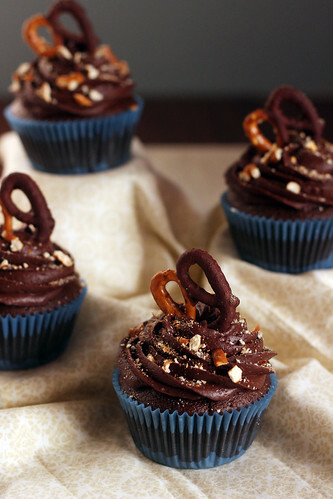 Chocolate Covered Pretzel Cupcakes – I made these for my good friend Krystal’s virtual baby shower. 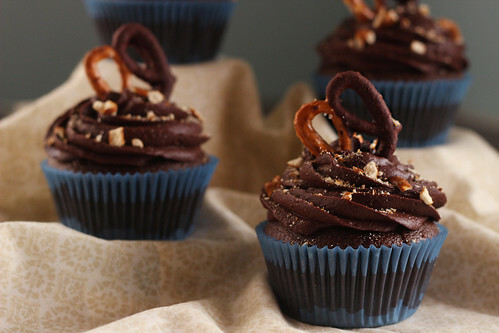 They are so, so delicious and rich. Creamy Taco Mac – This is a dish I’ve been making for a long time and I was finally able to get a blog-worthy photo. It’s like a homemade Hamburger Helper. 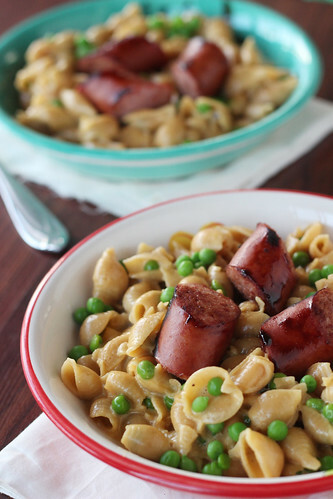 Easy, delicious, and not terribly bad for you. I took this photo (another super bathroom self-pic) on Wednesday when I was officially 23 weeks. I don’t feel like I grew much this past week, but I do notice that I struggle to do weird things now. Getting off the couch or out of bed is just a little more difficult than it used to be! I thought it might be fun to start using this space to answer some of those cheesy pregnancy journal questions. Movement? Lots of flips and turns. She went through a phase where she really liked to kick my belly button. Looking forward to? I’m really looking forward to traveling back to Ohio in a few weeks for my baby shower! I can’t go a week without sharing a photo of my sweet cats. The other day I walked in on them both passed out on the (unmade) bed. Cat life is tough, but someone’s got to do it. Our sweet baby girl is already so lucky and loved. She got her first package in the mail! The start of what I am sure will be a nice little collection of pink. Thanks to my mother-in-law for the sweet package! I’ve been pretty diligent about making a meal plan and sticking to it for the last several weeks, but for some reason Fridays are hard. This Friday I was having major Chinese food cravings. Specifically the green beans that I loved so much when we lived there. We went to a new restaurant and they had them on the menu! Unfortunately they were AS good as the real deal in China, but they were close enough! Angelsounds Fetal Heart Doppler – Around week 12 I got really nervous one day and ordered a prenatal home doppler online. I try not to use it compulsively but it’s nice to be able to get a quick listen. It’s also awesome because you can hook it up to your computer and record the heartbeat. We listened and recorded last night and sent the audio to our moms this morning for mother’s day. It’s amazing. Camelbak Waterbottles – Sometimes I struggle with keeping myself hydrated. I just don’t think about filling up a glass of water. With one of these water bottles it’s so much easier. It holds 32 ounces and I just do my best to finish one or two a day, on top of whatever I drink with meals. I like this particular water bottle because it’s easy to carry and has the retractable mouthpiece. Game of Thrones – Do you watch this show?? I loooove it. It’s crazy and weird and dramatic and entertaining. That’s a wrap! Thank you so much for stopping by and reading. Have a great weekend and be sure to check back later this week, I’ll be sharing the recipe for the first batch of ice cream I made this season. Yum! Lately I’ve noticed lots of my favorite bloggers doing weekly (or occasional) weekend posts that are a little more personal than just a photo and a recipe. I love seeing an extra glimpse into their life and I thought it might be fun to do something similar around here. I can’t promise that I will be able to keep up with it every week, but whenever I have time I think it will be a nice way to stay connected. If you just come here for the food, feel free to skip this post but be sure to check back during the week for tasty recipes and yummy food photos! 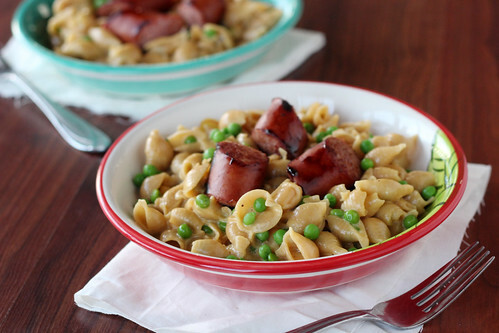 Shells and Cheese with Kielbasa and Peas -A quick and easy weeknight dinner that’s sure to satisfy your whole family (pasta and meat lovers alike!)! Chocolate Chip Muffins – Light and fluffy muffins studded with chocolate chips. AKA – the perfect second breakfast. This was technically last week, but I couldn’t resist sharing this picture! Last week I traveled to Boston to watch my cousin (along with many other dancers from my former school) dance in the World Championships for Irish Dancing. Someone caught this shot of my cousin during her second round and I’m obsessed! She danced well and even recalled at her first Worlds! So exciting. And this is a familiar scene in my living room. Every night I put all the cat toys on top of the cat tree, every morning I wake up to the toys being sprawled across the living room. Funny, because they rarely play with them when we’re awake. Yesterday I found this awesome new nail polish – at Kohl’s of all places! I’m super excited about it! In case you missed the announcement – I’m pregnant! I am officially 18 weeks along and I feel really good! In week 16 we discovered that I have placenta previa so I’ve been trying to take it as easy as possibly, which is hard since I’m in the second trimester honeymoon phase and I have so much more energy! We also found out that we are having a girl! We are very excited! Around the web –just a few post from fellow bloggers and sites I’ve been surfing lately. Roasted Cauliflower Fettuccine – This just sounded so yummy to me! Baby Love: A Baby Shower – Babies are always on my mind right now and this shower was just adorable! Great job, Kelsey! Eggs Benedict con Queso – So this is actually not from this week, but, drool… just drool. Baby Names – Because seriously, naming a new human is hard! Bacon and Asparagus Pasta – Asparagus and I have had a thing lately. Absolutely loving it. And this has bacon. So, yeah. It may take me a few weeks to really get into a groove and decide what I like posting but I’m really excited to get a little more personal with my readers! That’s all for this week, but before I go, how was your week? ?